Let’s see how to factory Reset or wipe all data on iPhone 6 and iPhone 6 Plus with a hard reset. Do you have an iPhone 6 or iPhone 6 Plus but for some time now began to give some problems and its operation is not as flawless as just bought? If the answer is yes, and if you are looking for a viable solution know that the hard reset is definitely a good idea. Don’t you know how to reset the iPhone 6? Well, no problem, we can explain it to you. Before you can be alarmed and think the worst we will immediately reassure on one thing. 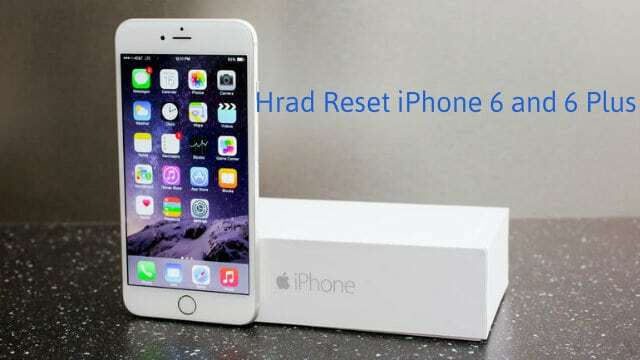 Hard reset iPhone 6 or iPhone 6 Plus is actually very simple. All you need is a little patience and attention, nothing, we assure you. To reset iPhone 6 Plus or 6, you do not need to be an expert. Note that doing hard reset iPhone 6 will delete all your settings, downloaded apps, and personal data. So make sure to sync your device and make a backup of your settings and apps before you proceed to do a factory reset. You can always perform a hard reset using the following methods to restore your iPhone to normal. To perform the restore of the iPhone, you can choose two options: via iTunes from PC or the resetting option of the device. The choice belongs only to you, the result is virtually identical. In this case, you need to install the application of Apple on your personal computer and if you have not yet done, press here to download and install the program on your Windows PC. iTunes is the official store of everything you need on your iPhone, and here are the steps for the hardware reset.  Close all tasks and go to the iTunes store.  Check and download the latest version, if necessary.  Now, connect your phone to your computer.  Get a backup, if necessary.  Click on Restore iPhone.  Tap to return to confirm the selection.  Finally, choose to agree to start the process. Once the process is started, it would take a few minutes before you can use your iPhone 6 problem free again. If you prefer to reset iPhone 6 without resorting to the use of iTunes you can also achieve it by acting directly from the device settings.  Close all the work and go to the home screen.  Tap the general option.  Select Erase All Content and Settings.  Tap delete iPhone to confirm. Now, it will take only a few minutes before you could get your iPhone back hassle free. Although, you must need to keep two things in mind to make sure you do not mess with the process.  Make a backup of all data before deleting your iPhone 6 as nothing could be recovered once the process is completed.  Make sure you have the sufficient battery level to avoid any disruption of the middle process, and that would be all. Restore settings to reset all the settings of iOS without deleting data. Restore network settings to restore the configuration for wireless networks and data connections. Restore Dictionary keyboard to restore the keyboard settings to factory state. Restore Home layout to reset the order of icons in the default Home screen. Restore location and privacy to reset the settings for privacy and geographical location.